We’re getting ready to go on a winter vacation with my parents and siblings right before Christmas. While I don’t ski, I’m looking forward to doing lots of other winter-y activities, especially since winter isn’t really winter in Texas. 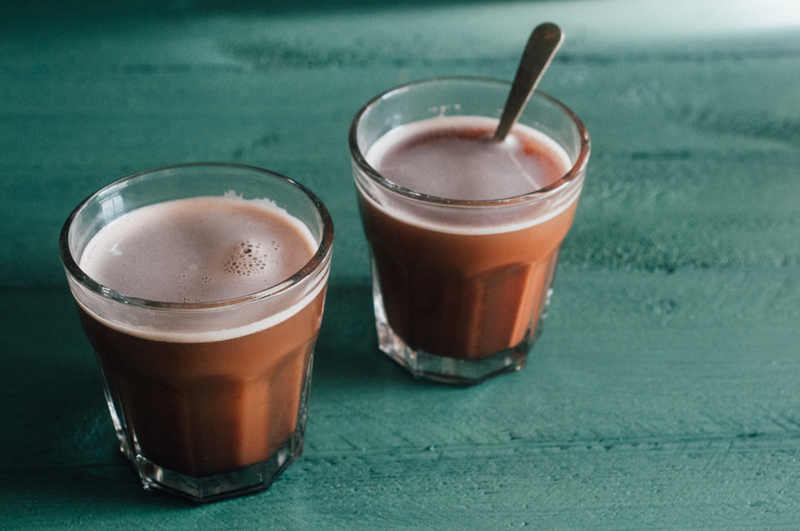 With winter activities, like skiing and ice skating and tubing etc, comes a craving for hot cocoa (or hot carob, if you’re on the autoimmune protocol and haven’t yet reintroduced chocolate). 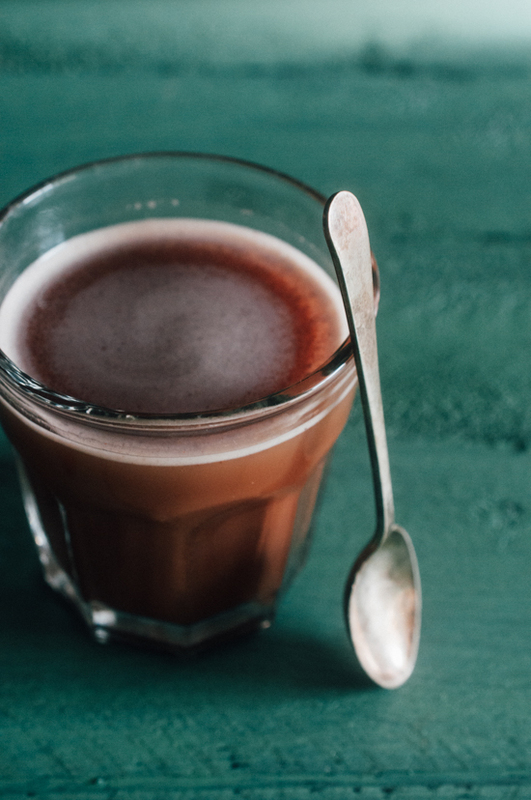 I’ve found plenty of recipes for paleo hot cocoa, and I myself even developed both a Paleo Fudge Sauce and AIP Carob Sauce last summer that would be excellent stirred into hot coconut milk. 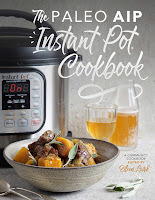 However, the downfalls to these recipes is that they either 1) require lots more preparation time and/or 2) they require liquid ingredients that are a challenge to transport, especially when one is traveling on an airplane with liquid restrictions. 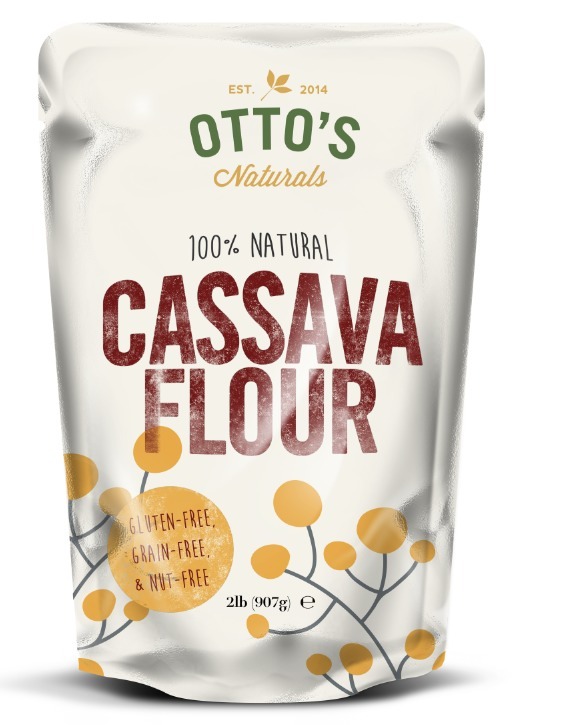 Recently I saw a post on social media about powdered coconut milk that was free from non-paleo/non AIP ingredients. I went on Amazon and ordered it immediately. 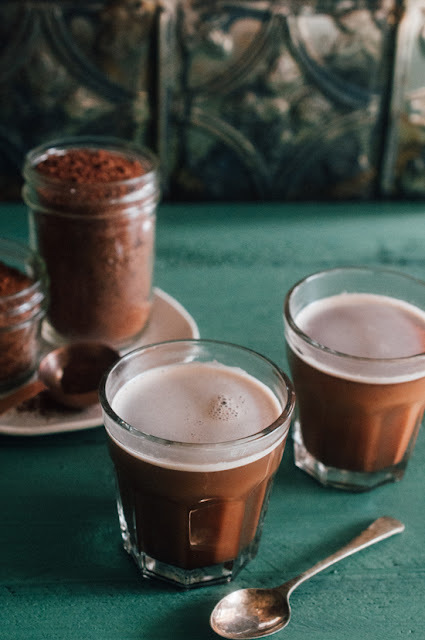 Having powdered coconut milk meant that I could make a dry hot cocoa mix that should not only travel easily but also could then be mixed into hot cocoa with only the addition of hot water! Hurray! I’ve reintroduced chocolate and cacao successfully, but I do still remember those days when I first began AIP and again when I did my AIP reset this summer when chocolate products were off the table. 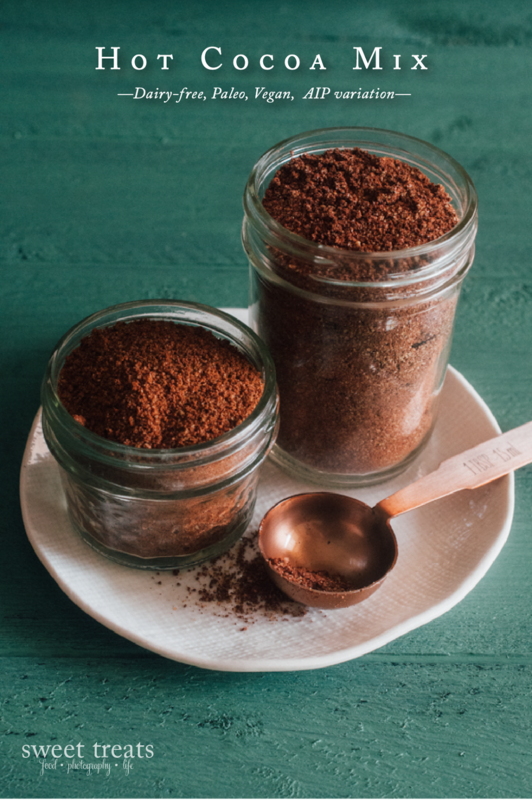 While roasted carob doesn’t taste *quite* the same as chocolate, I do think it’s better than nothing at all :) Luckily, it substitutes just great in this recipe so you can make it with either cacao or carob, depending on where you are on your health journey. For ease of transport, I’ll probably store the hot cocoa mix in plastic ziplock bags, but transferring the mix in a pretty jar and adding a little ribbon would make a really great, easy Christmas gift for someone who is Paleo, vegan, or simply avoiding dairy. Add the maple sugar, sea salt, and vanilla bean powder. Whisk to combine evenly. Transfer to an airtight container, such as a ziplock bag or small jars, for storage. Heat the water in the microwave or on the stove until very hot. 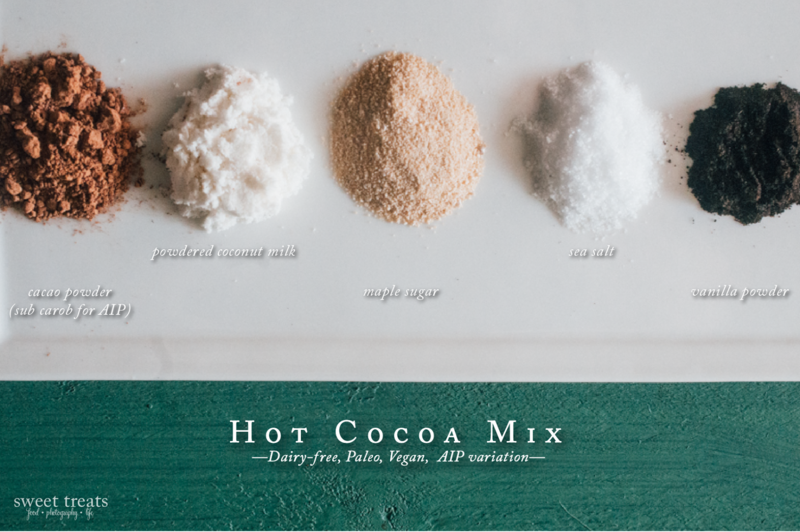 Mix in the hot cocoa mix & stir until very well combined. If the cocoa sits, it may begin to separate again, but simply stir it again to re-combine. For an even more luxurious beverage, use additive free coconut milk in lieu of water. 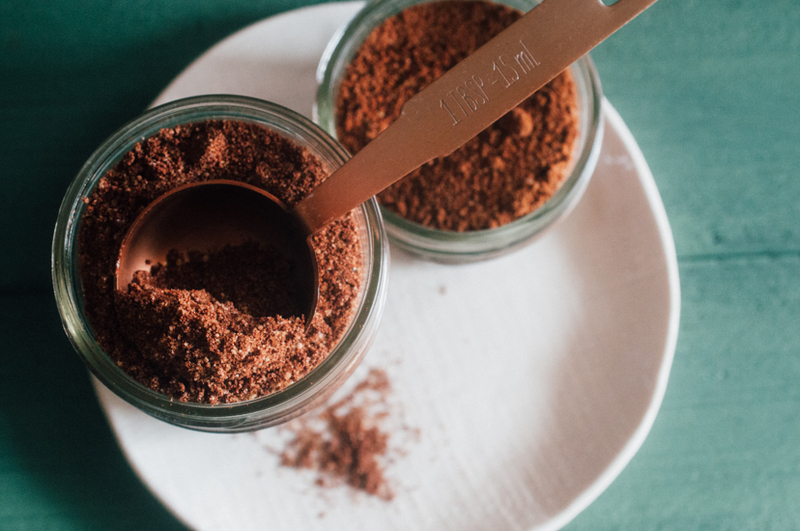 Mix with coffee (if successfully reintroduced) for a mocha. Add in a dash of peppermint extract for a peppermint hot cocoa. 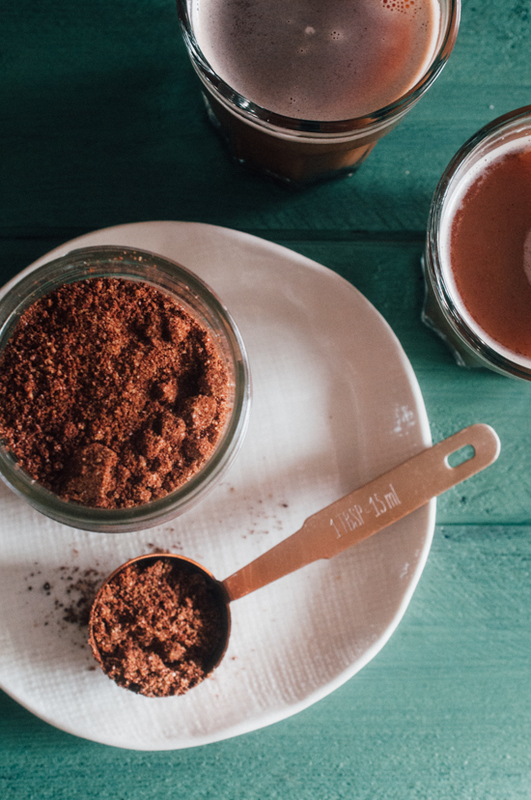 Add some cinnamon for a spiced hot cocoa. This post contains affiliate links. Thanks for supporting Sweet Treats. This is brilliant! I bought some of that coconut milk powder some time ago and had no idea what else to do with it. Can't wait to mix this up and give it to friends :) Thanks! Allow me to introduce myself. My name is Sarena and I am a fellow blogger. I'm reaching out to you to share some information on ShiftCon. Shiftcon Social Media Conference was created to support social media influencers who care about food, wellness, health and the environment. This conference blends professional workshops, networking, parties, and intense collaboration of changemakers from all over the United States under one roof. With a solid focus on green content creation, food & environmental activism, organic and nonGMO food, social media marketing, educating the public, natural products, recruiting additional influencers and making this world better for future generations, ShiftCon is unique in its draw and reach. We invite you to come and connect with brands and people who are really changing our future and experience ShiftCon! As a fellow lifestyle enthusiast that loves to share on a public forum, I'm hoping you will join me in creating a healthier, happier future for us and our environment. ShiftCon 2016 is set for December 1-3 in New Orleans, Louisiana! This is going to be an incredible weekend focused on eco-wellness education, food, fitness, fun and friendship! The “Early Bird” $249 tickets, which are $100 off the price of the regular ticket price are going fast! We are looking to add you to our circle of influencers. If you are interested in hearing more about the participating brands or agenda for ShiftCon, please let me know as soon as possible and I will keep you updated on the event. I really love this recipe. I've made some of the AIP version up and put it in a baggie to take on our next backpacking trip so I can have cocoa around the campfire. Cacao nibs have high nutritional content and great taste. That is why it highly recommended because it is rich in vitamins and minerals and provides healthy compounds which are required by the body. Did you know that you can get these ON AUTOPILOT AND TOTALLY FOR FREE by getting an account on Like 4 Like? 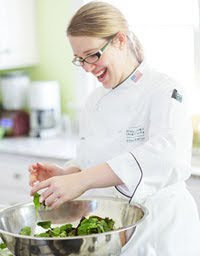 Welcome to “Sweet Treats” created by Laura, an autoimmune warrior & pastry chef who manages chronic illness through delicious, healthy food that promotes a vibrant, healthy, more fulfilling life. 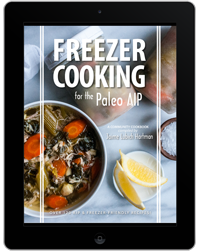 She lives in New Hampshire with her husband and follows the Autoimmune Protocol of Paleo (AIP) with a few reintroductions. This site contains affiliate links. In order to assist with funding this site, Sweet Treats may make a small commission from purchases made via links displayed. Thanks for your support. Copyright Laura E. Vein. All rights reserved. Simple theme. Powered by Blogger.